Uncarrier? Try unsustainable and unprofitable. The numbers reported, however, clearly call into question the sustainability of the company’s aggressive marketing strategy. Spin the results any way you want—and several Wall Street supporters are certainly taking their liberties. But it’s hard for any objective observer to be sanguine. True, T-Mobile USA grew its customer base by an outwardly impressive 1.645 million users in the last three months of 2013. And unlike in previous quarters, most weren’t low-margin prepaid customers. It’s also unclear, however, just what sort of users these new additions will be, since the company has done away with contracts. Will these “branded postpaid net additions” as T-Mobile calls them prove as sticky as contract customers historically have been? Or will the company start to see its customer loss or “churn” rate accelerate from the current 1.7 percent annualized rate, which is still 70 basis points above churn rates for AT&T (NYSE: T) and Verizon Communications (NYSE: VZ). The answer likely boils down to network reliability and quality. But without the cushion of contracts, there’s not a lot to stop T-Mobile USA users from moving on if they’re dissatisfied. Customer additions also came at a very high cost. Total revenue in fourth quarter 2013 was robust, rising 10.2 percent after taking into account the acquisition of MetroPCS. Smartphone sales hit a record 6.2 million units, or 91 percent of total phones sold. That suggests rising use of high-speed data, which is the key to improved margins. T-Mobile USA, however, experienced the polar opposite in its fourth quarter. Mainly, the combined services revenue of the company and MetroPCS was actually 1.1 percent lower than in the year ago quarter. So-called “Branded Postpaid Average Revenue Per User” fell by 2.9 percent, the consequence of offering so many discount plans for service. Cost per new customer rose by $10 during the quarter to $317 per. As a result, T-Mobile USA’s fourth quarter cash flow—again after leaving out non-recurring items—actually dropped 7.8 percent from the third quarter. In contrast to its sector rivals, the company did not include financial statements with its earnings release. The Form 10-K filed with the Securities and Exchange Commission, however, has plenty more disturbing news. Front and center is a collapse in operating margins. Leaving out $8.134 billion in “impairment charges in 2012, the company had $17.832 billion in total operating expenses that year. That figure was $23.424 billion in fourth quarter 2013. The 2012 figure compares to $19.719 billion in revenue, for a margin of $1.887 billion or 9.6 percent. The 2013 number compares to $24.420 billion in revenue, for a margin of $996 million, or 4.1 percent. Moving further down the income statement, combining interest expense to “affiliates” (Deutsche Telekom) along with interest presumably paid to outside investors yields a total of $1.223 billion, nearly twice the prior year’s $661 billion. That figure is certain to rise further in 2014. Management has announced capital spending plans of $4.3 to $4.6 billion in cash versus projections of cash flow before cash interest and taxes of $5.7 to $6 billion. Even leaving out taxes, cash interest alone will consume the difference. That in turn means more debt. In 2013, for example, T-Mobile issued $2.494 billion, versus a total of $324 million in repayments. That was despite a $1.787 billion stock offering. Of course, even elevated capital spending that are planned won’t come anywhere close to keeping up with AT&T and Verizon Communications. Both have announced capital spending plans in the neighborhood of the numbers they ran up last year, which I show in my table “Spend to Dominate.” That’s better than a 4-to-1 spending advantage for Verizon and a nearly 5-to-1 margin for AT&T. As for the bottom line, again leaving aside the one-time impairment charge, net income dropped by nearly 90 percent in 2013. That’s a shortfall the bulls have already forgiven this company for. But its red ink that’s likely to keep spilling in 2014, given that the fourth quarter was the third consecutive reporting period in which T-Mobile USA has suffered a loss. As my subscribers know, I keep an eagle eye on earnings for all the companies and all the sectors I cover, so poring through the numbers isn’t something I do for an article. It’s a regular and important feature (Utility Roundup) of Conrad’s Utility Investor and really makes a difference when sector players are negotiating for market share in a changing market environment. Perhaps the company will find a way to restore margins while competing on price with industry leaders. Its leading shareholder, however, hardly seems convinced. Two years ago, Deutsche Telekom (Germany: DTE, OTC: DTEGY) was thwarted in its attempt to sell all of T-Mobile USA to AT&T for $39 billion. After a 55 percent plus gain in the stock over the past 12 months, the unit’s market capitalization is back up to $24.5 billion. That puts the market value of Deutsche’s 66.71 percent at $16.34 billion. The German giant unloaded another 535,000-plus shares on December 31. In fact, insider sales have been fast and furious over the past 12 months, starting from a level in the low 20s. Deutsche Telekom’s apparent quest for a sale is almost certainly the biggest reason so many on Wall Street are still sticking around: 15 analysts rate the stock a buy, versus 11 holds and just one sell. And a much rumored deal No. 3 US wireless company Sprint (NYSE: S) would make a great deal of sense. A T-Mobile USA/Sprint combination would face some challenges, particularly when it comes to integrating networks and brands. But even assuming some attrition, the combined subscriber base of nearly 100 million would be comparable to AT&T and Verizon. The company would also have more than 50 million “post paid subscribers, much closer to Verizon’s 95 million and AT&T’s 70 million plus—though T-Mobile’s tearing up of contracts adds uncertainty to its numbers. More important, combined capital spending of the two companies in 2013 was $10.858 billion. Pooling efforts would no doubt create considerable synergies, quite possibly closing the spending gap even more with numbers one and two. Deutsche Telekom would demand an all-cash exit. But at a much more solid No. 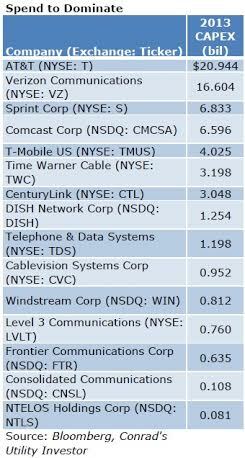 3 in a growing market, Sprint/T-Mobile would quite possibly enjoy far more favorable access to the capital markets. And Softbank (Japan: 9984, OTC: SFTBY)—Sprint’s 80 percent owner—has reportedly lined up banks to finance a deal. That’s a pretty good indication the parties are ready and willing to make a move. The question is, are they allowed to merge? Predictably, the US Dept of Justice and Federal Communications Commission have emerged as major hurdles to doing any deal. Both agencies have frequently decried the increasing concentration of wireless industry power and profit under AT&T and Verizon. But like their counterparts in Europe, they’ve bought into conventional wisdom that it must preserve four national competitors as some kind of magic number. And T-Mobile USA’s fourth quarter customer growth has only dug them in further. I reviewed both companies’ fourth-quarter results in my weekly Utility Update, a feature that’s available exclusively to Conrad’s Utility Investor subscribers. They may indeed have something less favorable to report for the first quarter in April. But results so far are a pretty good sign that despite all the media hype, they’re really not under threat. In fact, the only company whose financial security has been shaken is T-Mobile USA’s with its margin-crushing marketing strategy. Ironically, there’s a much bigger communications deal on the table that doesn’t seem to concern the FCC or DOJ much if at all, other than placating a few politicians. That’s Comcast’s (NSDQ: CMCSA) now very live bid for Time Warner Cable (NYSE: TWC), which if successful would leave 30 percent of US cable television users served by a single company operating a de facto monopoly in many areas. Comcast, however, seems much better represented than Japanese-owned Sprint or German-owned T-Mobile USA. And given past decisions by this FCC and DOJ, that’s likely to make all the difference. In the midst of all this price war talk, conventional wisdom has opened up considerable opportunity in the US communications sector. That includes not only the best and worst wireless providers, but also a much-maligned sub-sector group boasting yields as high as 12 percent and in the opening stages of an epic short squeeze. I’ll have my complete review in next week’s issue of Conrad’s Utility Investor. I’ll also host an exclusive Live Chat for subscribers on March 13, during which you can ask me anything about the more than 200 dividend-paying names I cover in my Utility Report Card. Not a subscriber? 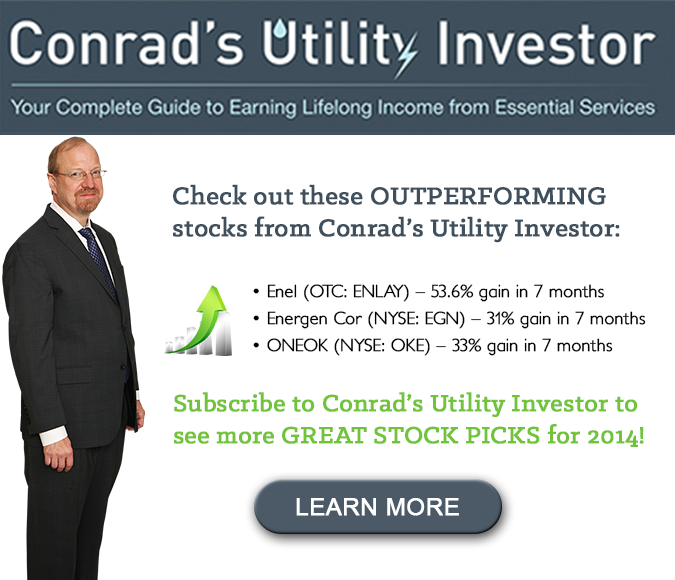 Sign up for Conrad’s Utility Investor today to make sure that you don’t miss out.